The digital marketing world is large, complex and currently changing at the speed of light. In order to maintain and expand your customer base, it’s critical that you learn everything there is to know about marketing (including the jargon) and do whatever it takes to not just keep up with the latest trends, but beat your competition to them. To make this task a bit easier for you, we’ve evaluated past trends and used them to compile a list of the digital marketing trends that you can expect to see in 2017. People’s willingness to read a piece of content is increased by 80% with the use of colored visuals. When information is paired with a relevant image, people are much more likely to retain that information several days later. 65% of senior marketing executives believe that visual assets, like images and videos, are essential to communicating their brand story. Content that includes relevant images gets 94% more views than content without any relevant images. Considering these outstanding visual content statistics, it makes sense that the more image-driven platforms like Snapchat (launched in 2011), Pinterest (launched in 2010), and Instagram (launched in 2010) are sure to see huge increases in popularity and growth in 2017, less than a decade after launching. From May 2015 to May 2016, Snapchat’s daily video views increased by 400%, from 2 billion to 10 billion. From March 2014 to June 2016, the number of active daily Snapchat users grew from 50 million to 150 million (see image below). It is predicted that by the end of 2017, Snapchat will have over 217 million active daily users. In 2015, international growth on Pinterest was nearly 135%, higher than almost any of the other major social media platforms. About 83% of active Pinterest users say they purchased something because they saw it on Pinterest. In October 2016, Pinterest reached 150 million active monthly users. 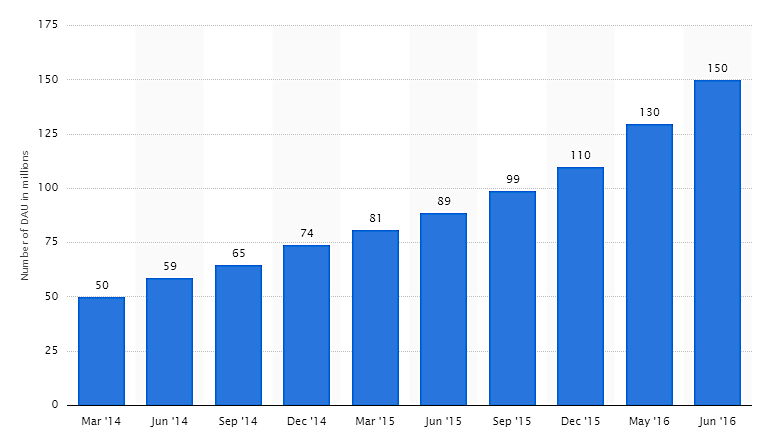 From 2013 to 2015, Instagram membership and usage nearly doubled. From August 2015 to December 2015, ad impressions on Instagram rose more than 13x from 50 million to 670 million. 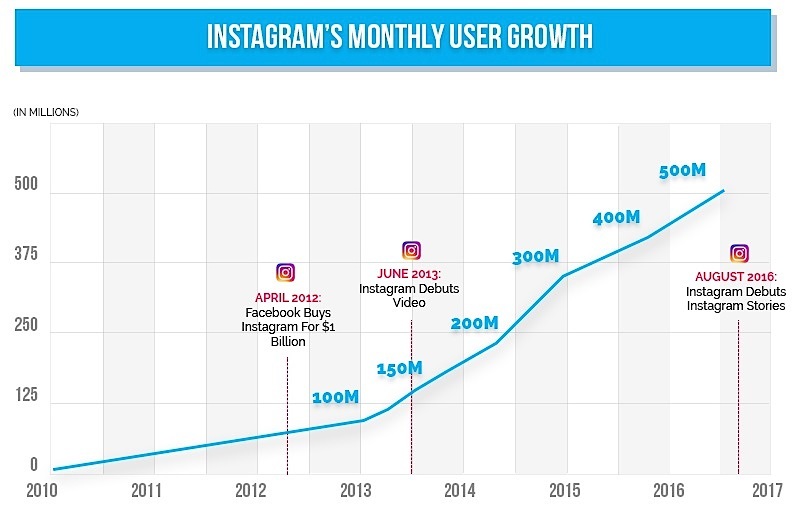 As of June of 2016, Instagram had more than 500 million users — more than 300 million of whom use the network on a daily basis (see image below). In 2016, nearly half of U.S. brands were using Instagram for marketing purposes. In 2017, Mediakix predicts that over 70% of U.S. companies will use Instagram for marketing purposes. By 2017, Instagram’s global mobile ad revenues are expected to reach $2.81 billion. While text-based content will always be an important, deep-rooted part of marketing, visual content marketing will continue to be one of the hottest marketing trends. Consider this: 65% of people consider themselves to be visual learners and a staggering 90% of information that the brain absorbs is visual. So it only makes sense to use visual mediums to step up your digital marketing game. Videos are incredibly useful for advertising. 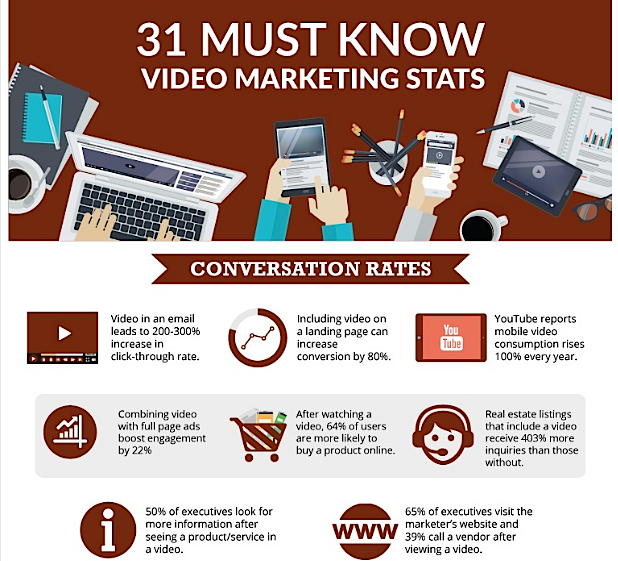 In fact, one study showed that having a video on your landing page can increase conversions by 86%! Video marketing can come in many different forms and can serve a variety of purposes. Consider tutorials or how-to videos, demonstration videos, explainer videos, animated videos, and videos of customer tutorials. The options are practically endless. Although video ads are nothing new, the use of video ads for marketing is growing substantially, and will continue to do so in 2017. Infographics allow marketers to compile complex data, statistics, and facts all into one easy-to-digest visual display (see image below). It is ideal to include infographics in your 2017 marketing strategy as they are have several benefits, including landing page optimization, networking with other key influencers, and social media engagement. Although a bit less common than using videos or infographics, screenshots for marketing purposes will still be on the rise. Screenshots are an excellent way to illustrate complex instructions visually, such as describing how to set up goals in Google Analytics. Consider using screenshots for things like providing specific examples that are easier to point out visually instead of verbally. For example, often times, SaaS companies will display their dashboard on a laptop for viewers to take a look at. Many companies are already starting to recognize how live-streaming video can provide a whole new world of possibilities for sharing and building their brands. Consider this: the first 2016 Presidential debate was live-streamed this year! That just goes to show how popular live-streaming has become with platforms such as Facebook Live, Periscope, and YouTube Connect, and how it is sure to become even more common throughout 2017. Over 45% of organic search engine visits in the U.S. come from mobile devices. More than 93 million people use Facebook mobile in the U.S., and more than 109 million people use the Facebook mobile app. In 2017, more than 90% of all Internet users will access the web through their mobile phones. It is important to be seen as a thought leader in your market. Platforms such as Medium and Contently, and tools like LinkedIn Pulse and Facebook Instant Articles, offer content writers the opportunity to publish and respond to articles to establish that leadership. Medium is a free and open platform where anyone can express themselves. As a brand, Medium is a place where executives or CEOs can write articles in their areas of expertise to help establish leadership and brand awareness, which can trickle down to more leads and sales. 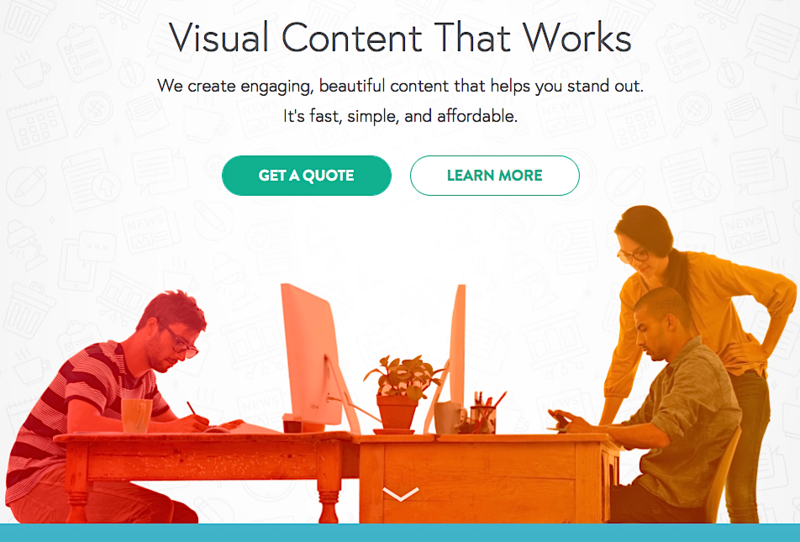 Contently is a company built by content creators, for content creators. The platform helps brands create great content at scale, providing them with smart technology, content marketing expertise, and creative talent from journalists, photographers, designers, videographers, and the like. LinkedIn Pulse is a platform where articles can be posted by LinkedIn users and have the potential to be seen by an even greater audience than ever before. The publishing platform provides over 130,000 unique articles every week, making Pulse one of the fastest growing tools on LinkedIn today. Facebook Instant Articles is a tool open to all types of publishers, anywhere in the world. The platform allows publishers to quickly and easily create immersive and interactive articles on Facebook for wide audiences to see. The Internet of Things (a.k.a. IoT) has become a huge topic of conversation in this last year. But what exactly is it? 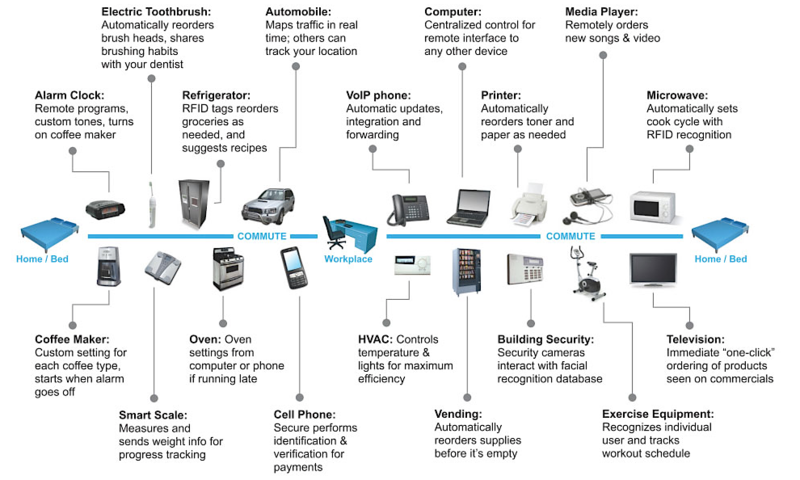 The IoT is a massive network of devices connected to the Internet and/or each other. This can include anything and everything with an on/off switch: computers, printers, cell phones, headphones, coffee makers, televisions, washing machines, lamps, security systems, cars — the options and opportunities are virtually endless. As the IoT expands even further, indoor location technology will allow marketers to connect with consumers on a ‘real-time’ basis, and interact with them during their in-store experiences, even more than they already do. For example, marketers can tell when a customer has been lingering near a product for a while, and can send messages to the consumer’s smartphone, encouraging the sale or offering a promotion. This type of narrowed-in personalization is only going to increase over time, providing more insight into consumer behavior. Marketers will get a better picture of what exactly the consumer is doing, as well as when and why they are buying or not buying. Along with increased personalization comes increased intimacy between you and your customers. IoT technologies like social media and cloud computing provide consumers with the opportunity to provide instantaneous feedback to you as a brand. In turn, responding quickly to consumers is an ideal way to increase intimate connections with them. With the IoT providing increased insight into consumer behavioral patterns, marketers will be able to focus their efforts on a more specific target, customizing the experience for each user. So let’s break this down a bit. Marketers can use IoT data to study consumers and target a specific audience; they can communicate directly with their target audience while improving customer service. This improved customer service can only help increase marketers’ chances of conversion. Since the IoT is optimized for use with social media, marketers will be able to better predict the development of social communities and target their efforts toward these communities. This will allow marketers to reach more potential customers than ever before. Although the IoT is still a bit complicated for the average person, it’s extremely important to understand, as it is another marketing trend we’re likely to see much more of in 2017. In fact, by 2020, experts predict there will be over 26 billion devices connected via the IoT. The amount of wearable technology today is incredible. From the Apple iWatch, Google Glass, Moto 360, and so many other smart devices, you can literally be connected everywhere you go. In 2017 we are going to see even more innovations in wearable technology, which is a game-changer for digital marketing. The 360-degree video capabilities of this technology, virtually transports the user to sporting events, music concerts, the wilderness and more! It’s not just an advertisement, it’s an experience. For example, the hiking boot company Merrell launched a VR ad this year that gave the user an experience of walking on an old shambled bridge up high in the mountains. This takes the user away from watching the advertisement to actually being in it. When it comes to choosing which marketing tools to incorporate into your marketing strategy, it’s important to consider all the different types, including data visualization tools, social media tools, as well as general marketing tools (find more complete lists that we can include in this article by clicking on these links). Chart.js is the perfect data visualization tool for designers and developers looking to create small projects, using responsive and engaging designs. 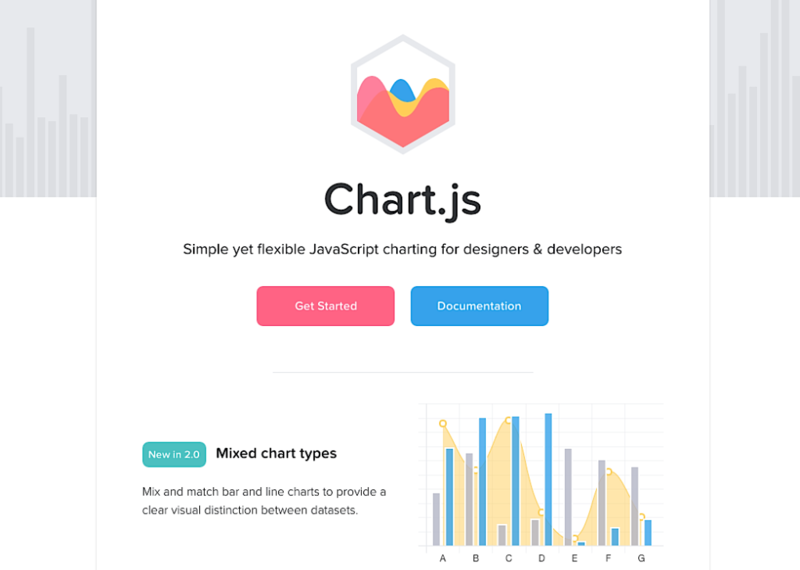 Although Chart.js currently only contains six types of charts, the tool is quickly becoming one of the most popular open-source charting libraries on the market. Tableau is another popular data visualization tool that is completely free. This tool offers a wide variety of graphs, charts, and maps. Users can quickly and easily drag and drop data into the system and watch it update in real time, just like that. Furthermore, you can collaborate with other team members, allowing for quick project turnaround. 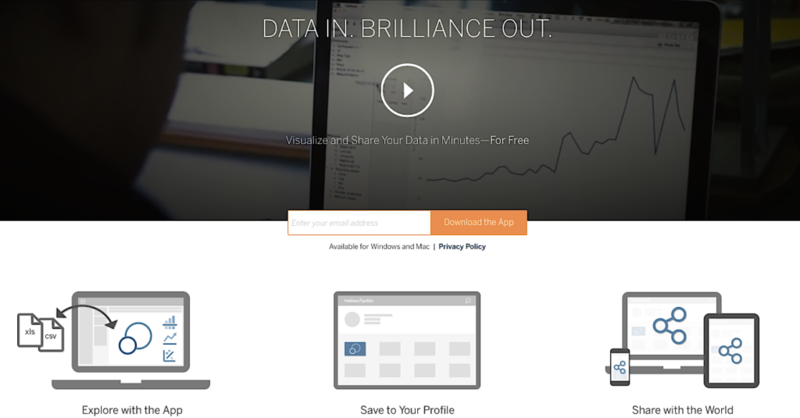 Visually is a data visualization tool that combines videos, infographics, e-books, reports, presentations, and much more. 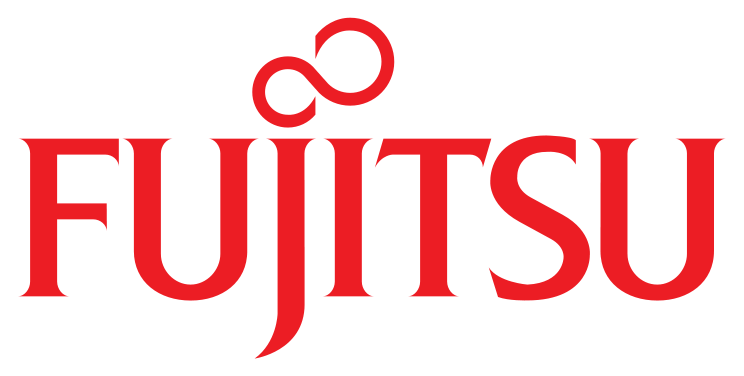 It offers a simple yet effective toolset for building outstanding data representations. With two pricing options (free or $10/month), Quuu hand-curates content for you and delivers it right to your Buffer queue. The only thing required is to connect Quuu to your Buffer account and select any categories that are interesting and relevant to you and your audience. Once Quuu sends content to your Buffer queue, you can manually edit the suggestions if necessary. This popular news-reading app is another tool great for content curation. Panda 5 can be used for free, or upgraded to just $4.99/month, and its sole purpose is to help you speed up your content curation process by allowing you to browse a number of websites all at once, integrate with other websites, and gather RSS feeds of your favorite content. Cyfe is an all-in-one marketing dashboard that helps marketers identify what exactly is working for them and what isn’t. This tool allows you to collect detailed reports on Google Analytics, AdWords campaigns, SEO, competitive searches, brand mentions on the web, and more. Beegit is an online writing platform designed to help streamline team collaboration, making it easier for marketers to create, share, edit, and approve web content together, no matter where they are located. The tool includes an editorial calendar, as well as communication, workflow, and writing tools. With the constantly evolving technology, your marketing plans and success tools need to adapt. As discussed earlier, Snapchat is one of the most widely used social media platforms. So if your target market participates on this network, your brand needs to be on there, too. 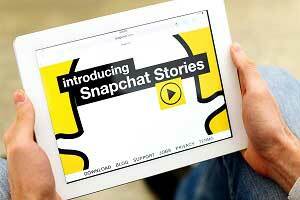 Learn how Snapchat can be used to increase brand awareness and drive traffic to landing pages. The difference between promoting videos on Snapchat and on any other platform is that Snapchat clips expire after a short time. The idea behind this is that because of the video’s limited availability, consumers are more likely to pay attention to the video and to the specific offer. This can help increase your brand’s awareness, as well as generate sales and/or conversions. Just remember, if your goal is not only to increase brand awareness, but also to drive traffic to any of your landing pages to increase conversions, be sure to direct users in that direction in your video. Visit this Instapage webpage for more information about creating effective squeeze pages and how they differ from landing pages. Build an audience. In order to build a following you need to cross-promote through other platforms, such as Instagram, Twitter and Facebook, or via cross-promotion with a related brand in your industry. Encourage your followers to come follow you on Snapchat. Define your contest rules. Go into your contest with a defined plan. This should include your contest dates, the method of how a winner will be chosen, how the winner will be notified, how long the winner has to respond, etc. Most Snapchat contests only run for 24 hours due to the fast pace of the app. You can create a short blog post that includes all this information and share it on your other platforms as well. Keep in mind, you’ll want to take screenshots of all your photo entries for judging! Share entries through your feed. Doing this will engage your community and get more people interested in the contest. If you have a new product or a new feature, share it! This is definitely one of the easiest ways to increase your brand awareness through Snapchat. Create a demonstration photo or an instructional video and share it with your followers. 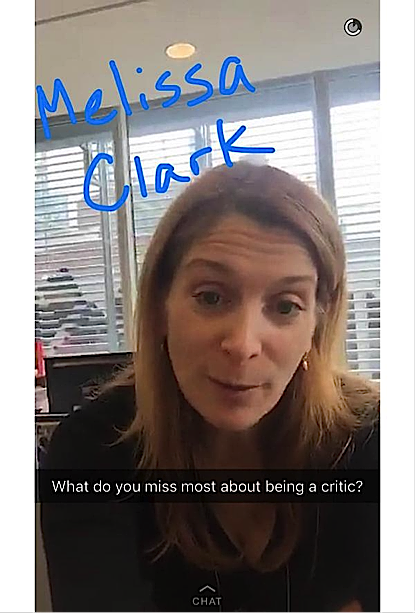 Hosting a Snapchat Q&A is another great way to increase brand awareness and build an established Snapchat following. To do this, you must first set a specific date and time for your Q&A. Encourage all your followers to send in their questions via Snapchat before this date to ensure that you have enough questions when your Q&A airs. When choosing which questions to answer, be sure to make it a mix of both business-related questions and other less serious questions in order to humanize your brand a bit more. Be sure to then direct viewers to your landing page to register for the event. Since snaps cannot be hyperlinked (e.g. to a landing page), the best way to send out your link is to add a text overlay with your link. Users can then screenshot the snap and search your link outside of Snapchat. Reach out to key influencers in your target market to inquire about creating a sponsored post with them. 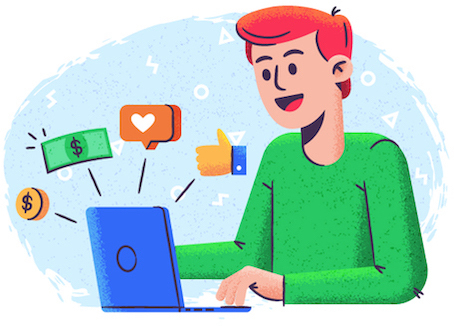 Although it may take some time to see desired results, having a trustworthy influencer support your brand certainly increases brand awareness, and may even lead to an expanded following and customer base. Engage in Snapchat takeovers. A Snapchat takeover is when a Brand A allows Brand B to “take over” their Snapchat account for a certain period of time, so that Brand B can create their own story to enhance Brand A’s company. During this time, Brand B also typically sends all of its followers over to Brand A’s account to watch the snaps. Monitoring the latest digital marketing trends can only help you better engage with your target audience. Whether that means engaging on different social media networks, alternating content platforms, or using more visual media, technology is constantly evolving so you need to evolve with it. Keeping an eye on past trends has allowed us to compile this list of the digital marketing trends that you can expect to see in 2017. What marketing trends do you plan on investing more into in 2017? Stephanie Mialki is a Content Writer for Instapage. She’s a graduate of St. Bonaventure University with a Bachelor's degree in Journalism and Mass Communication. Follow her on Twitter @Stephaniemialki.